Well, Australia sure as heck isn't. But Italy apparently is. I met a man named Nick recently. He's a real estate agent, a very nice guy, and an excellent driver. He moved to Australia from Italy with his parents when he was 7 years old shortly after the war, and four years ago he paid a long-overdue visit to his birthplace. Nick told me this amazing story that happened to him on his trip. At a local cafe, the woman behind the counter asked him which part of America he was from (making a safe assumption, since he was obviously an English-speaking tourist and rather under-tall for his weight). Nick: No, actually I'm from Australia. Woman: Is that so? Which part? Woman: Really? Which part of Western Australia? Nick (unsure of how well she knows Western Australian geography): Um, sort of around the Perth area. Woman: Oh. Is that anywhere near Hamilton Hill? Nick (very surprised): Hamilton Hill is a suburb of Perth, one of about 200 or so, but also happens to be where I live! Woman: Interesting. See, I have a brother-in-law who lives in Hamilton Hill. His name is Vincenzo T----. Nick (falling out of his chair): That's . . . that's my Uncle Vinnie! Woman (looking closer at him): . . . Niccola? Is that you? Mio nipote! Exactly how big IS this place? The States and Territories of Australia are New South Wales, Victoria, South Australia, Queensland, Northern Territories, Australian Capital Territory (ACT) (basically Canberra), and Western Australia. Oh, and Tasmania, too, but we always forget them because they're not attached to the main continent. And that infuriates them to no end. I've mentioned before that the state of Western Australia (they didn't strain themselves thinking up a name, did they?) occupies nearly 2% of the Earth's land area. Just how big is that? WA could hold three and a half Texases. Texans also outnumber Western Australians 11 to 1, so by our standards, the Lone Star state is a pretty crowded place. California fits into WA six and a quarter times, and there are 16 Californicators for every West Australian. I'm pretty sure that's what they're calling themselves these days. But I don't watch the news much, so I could be wrong. Arizona or Nevada would both fit into WA 8 or 9 times, but only Nevada has a similar population (2.6 million versus 2.3 million in WA). It has other odd similarities, too. While there are roughly four New Jersey-ites for every one West Australian, we could fit that teeny, tiny weeny little state inside WA 132 times. One hundred and thirty two New Jerseys! But we're not going to do that. Because then there would be 1.14 BILLION New Jersey-ites, and a fine mess that would be. Want to learn more about yourself, your culture and your native country than you ever thought possible? Then do what I did. Move overseas for a decade or so. I've been in Australia for 10 years give or take, and I'm still finding out new things. Things about America as often as about Australia. For instance, I never understood the extent to which Americans unconsciously rely on Shopping and Food as the solution to everything. And don't get me started about shopping FOR food. Looking for your favorite breakfast cereal? Forget it. There are two varieties of sugary cereals in Australia. One of them is fruity-rings and the other I can't even think of because it's so incredibly boring. Australia's coasts were charted by Captains Cook, Dampier, Hartog and Flinders, but Captain Crunch evidently never ventured this far south. Count Chocula simply cannot endure the exeptionally bright sunlight. Australian school children are so good at reading that letter-based sweetened oat cereal is completely unnecessary (and unavailable). Although there are large numbers of Irish here, none of them seem to have remembered to bring their Lucky Charms. They say Trix are for kids, but they really mean only non-Australian kids. 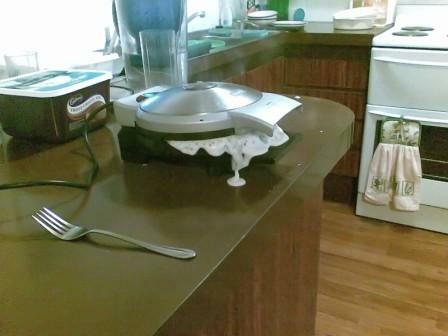 Instead, the typical Australian breakfast table is provided with something called Weet Bix. I was offered this during my first week here. My host asked if we have something similar in America. After chewing for a moment, I said, "Yes. We call it 'Cardboard.'" I subsist largely on a diet of red meat and peanut butter sandwiches, so my first forays into Australian grocery stores were not particularly ambitious. Yet they were still frustrating. If you buy beef here, don't waste your time or money on the cheap stuff unless you're going to stew it in a slow-cooker for a "fortnight" (an Australian unit of time equal to how long it takes a plumber to turn up). It took me a while to discover that really good beef was available, but you had to either drive to a cattle-raising area and dine at the local pub, or pay at least $15 per pound. One happy discovery was Lamb. If you're an American and you don't like lamb, you have excellent taste. Lamb is generally terrible in the U.S. But please give Australian lamb a try. It alone is worth the trip. Australian lamb is probably the third Best Thing about Australia in my opinion. When I buy peanut butter in America, I have plenty of options. I can choose from 8 different brands, most of which come in five different sizes: Convenience size, Normal size, Family size, Economy size, and Preparing For Armageddon (44-gallon drum, your choice of smooth, crunchy, or super-chunk). In Australia, there are two brands and two sizes, the smaller of which is almost enough for one whole sandwich. Wow. 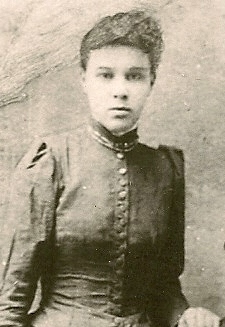 at age 19, on her wedding day. Because my Great-Grandmother Cash was a southern lady who went out west in 1900, my family still has a taste for Southern cooking and some recipes handed down. My own mother, in addition to being a professional educator, accomplished pianist, one of my three favorite artists, and an excellent driver, is also a wonderful cook. I failed to appreciate this fact until I moved out on my own. The following Thursday I phoned her up and asked how she manages to get her pie crusts so tender and flaky. When I came to Australia, my problem was first converting all of Minnie Cash's recipes into metric. That felt weird, and was harder than it sounds. Butter in the US is measured in ounces of volume, but in Australia is measured in grams of mass. Does anyone know the density of butter? I do. Crisco? Nope. Not available here. Closest approximation is something called "Copha" and it comes in a very small block and not a large tub. It's also hard and doesn't blend right. Bisquick? I wish. I've never yet had a really good waffle here. Baking powder? There is something by that name used for the same purpose, but it's never real baking powder. It tastes funny. It doesn't rise half as well. None of my recipes worked. I tried every brand (both of them). Today I get all my baking powder from the US. Even ordinary wheat flour seems to respond differently to moisture. After converting all my recipes into metric, I've had to adjust the proportions of everything. To this day I've never managed to make a respectable Cornbread that my great-grandma Cash would approve of. And then there's the language barrier. Biscuits (a Cash recipe: flour, salt, baking powder, lard, milk) are one of my favorite breakfast foods, but in Australia, a cookie is a biscuit, and a biscuit is a "scone" (rhymes with gone) served in the afternoon, not at breakfast. Where I'm from a "scone" (rhymes with bone) is a yeast dough fried in oil, served with powdered sugar and honey. Mentioning biscuits therefore causes significant confusion and misunderstanding. Cilantro , a necessary ingredient for Mexican food, doesn't exist here. Unheard-of. Unobtainable. Impossible to get. Coriander, on the other hand, is plentiful and easily obtainable. Fortunately, they are exactly one and the same thing. People often ask me what Australian cuisine is like. Well, that's a hard question to answer. Australia doesn't really have a cuisine of its own, unless you count plain over-cooked meat, which isn't exactly unique. I've always held that the biggest problem with Australia is that it was started by Britain, home of such culinary innovations as boiled beef and exotic dishes such as "potatoes." From the English, we have meat pies, sausages with big, hard pieces of gristle or cartilage in them, and fish and chips. While TV shows about cooking and food are extremely popular here, Australians in general seem to take very little notice of what they eat or how they prepare it. "It's food if you can keep it down ya." Baked beans and toast is eaten breakfast, lunch and dinner by the arch-typical "Aussie Battler" (the economically disadvantaged, and proud of it). A "burger" can be anything including sometimes beef, served on bread with a fried egg and sliced beets. Yes, beets, as in "that gross vegetable nobody eats on purpose." I've mentioned the absence of Mexican food before. There is something called "guacamole" for sale in the stores here. It is a smooth, pale green, bland dip made from cream and has real, genuine "Avocado Guacamole" printed right on the packaging. Those letters are the only relation this product bears to actual Guacamole. In Australia, the best guacamole is that which I make myself. It's chunky, spicy, and it doesn't involve cream in any way. I also make the best burritos in the entire country, as well as the only serviceable flour tortillas (flour, lard, salt water, four hours, then roll so thin you can see through it). My own pizza is also the best approximation to genuine American pizza. Unless you happen to like beets. While Coke and Pepsi are needlessly abundant, the more interesting soft-drinks aren't. The only Root Beer available in Australia is canned A&W imported from Singapore. As an alternative, I've discovered that the world's best Ginger Beer is made in Tasmania (the forgotten Australian state). Why are silly things like food important to me? I didn't realize they were until they weren't available. The only way for a fish to understand water is to take it out for a while. Will I ever go back to the US? As long as I can get an occasional fix of Mexican food, Root Beer and waffles every so often, and have a supply of proper baking powder, I'm content to stay for a while. Latrodectus Hasselti, or the Australian Redback Spider, normally does not come out during the day, preferring to hide in small crevices close to the ground. Since we have been getting a lot of rain the last few days (this being towards the end of the Australian winter and Perth's wet season), I hypothesize that this small-ish specimen has been temporarily flooded out of her usual abode. This provides you and me with a very rare opportunity! There it was, up close, not moving, with the remains of a recent meal nearby, and with scarcely a thought of springing suddenly onto my face and biting my nose. This doesn't happen very often. On Monday, I got out the Nikon , grabbed the small Tripod and waited for the sun to come out. A crevice of a brick wall isn't the greatest place to try to hide, but it might have gotten away with it had it not been right next to the front door of my house where I had to nervously edge past every time I came or went. But it's still far better than the time I shared a shower with one of these creatures dangling by a single strand of web inches from my unclothed torso. My reaction then was to immediately and decisively drop the soap and say, "WTF? Are you KIDDING me?" See, that's what the experts say you're supposed to do. As a reward for posing so obligingly for these photos, I generously provided this creature with a lifetime supply of imiprothrin (0.7 g/kg) and cypermethrin (2.0 g/kg) in aerosol form. That's only about one half-second squirt, seeing as how its lifetime was to be just 45 more seconds. We spend a large portion of our short time on this blue rock behind the wheel of a vehicle. The experience of living in a foreign country is therefore defined in large measure by the experience of driving in a foreign country. I was thinking about this while driving up to Bindoon to spend a few days decompressing and composing myself at the Shed. I was going to say "decomposing myself," but realized that isn't quite the right word. The difficulty is that in order to reach solitude and peace, I am forced to endure the least relaxing thing in the known universe: Traffic. As much as I complain about Perth traffic, I am told that Sydney is far, far worse. No planning whatsoever went in to most pre-Federation Australian cities. Roads are scattered higglety-pigglety every which way, and woefully under-built for the number of cars attempting to use them. You can never go in a straight path from one place to another, but are forced to zig-zag, double back, and negotiate multiple turns, merges, and oddly-shaped intersections. Things don't improve when you get out of town. The narrow, meandering two-lane country road that takes me up to Bindoon is called The Great Northern Highway (for some reason) and is the main artery connecting Perth to the entire north of the state of Western Australia, a state which comprises nearly 2% of the Earth's land surface! TWO PERCENT! Police propaganda claims that speed is the enemy. I completely disagree. I speed multiple times every day and I am clearly not dead, much less dead 10,000 times over. All the multi-car accidents I ever had (3) were at speeds of 10 mph or less. Speed doesn't cause accidents, but it definitely makes them worse. The true cause of accidents is driver inattention and improperly designed and built roads. Even vehicle failure at high speeds (wheel falls off, etc) need not be fatal if a) the driver is paying attention and knows what to do, and b) the road has been built correctly. Traffic engineers everywhere except Australia understand that a road is safe when it is Straight, Wide and Flat. The Great Northern Highway is none of these. What's more, it carries a large amount of the most incompatible traffic imaginable: people like me with places to go and things to do, and those with nowhere to go and all day to get there. That's right. Old people towing caravans. They trundle along at 45 mph (80 kph) in a 70 mph (110 kph) zone. The driver always wears a hat. The passenger is a shriveled old woman who can't see over the dashboard, though at least, thank goodness, she is not driving. And there won't be any place to pass them for miles and miles. Unless, that is, you know this road like the back of your hand and are occasionally very lucky. This last trip I was exceptionally lucky. I passed two "road trains" (semi trucks with multiple trailers) and two caravans in my battered Toyota truck. Because it has 445,000 kms (276,000 miles) and no discernible acceleration, you have to get a running start to have a hope of passing anything. And you have to know when to begin, based on where the rare straight stretches of road are found. About a mile before I knew a chance was coming, I fell back a hundred yards or so behind a car towing a caravan. Then I dropped down into third and floored it. About a minute and a half later, I came up on the caravan's rear bumper just as a long straight stretch of the highway became visible, and as luck would have it, there was no oncoming traffic. Without losing any momentum I popped out into the oncoming lane going about 50 mph with the 1.8 liter engine screaming and the truck rattling and straining. The truck edged ever so slowly past the caravan. I looked over at the driver and noticed he was wearing a hat. I could not see the passenger, possibly because she was too shriveled and buried under a folding paper map which I could tell was being less helpful than they imagined. Looking forward, I noticed a car had come into view heading towards me at a combined speed of 130 mph. Roads that are not straight and flat can easily hide cars until they are right on top of you. That's what makes them dangerous. And being narrow, there is no escape. Trees have been allowed to grow perilously close to the road. But by then I had found 4th gear and was edging past the caravan at 60 mph, almost able to visualize finally reaching the posted limit of 110 kph or 68.3 mph. I swung back into the left lane well before the oncoming car flashed past. The man in the hat made an angry, hand-waving gesture at me. What a knob. Of course if instead of the truck I take my ageing BMW with its 2.5 liter race-bred straight 6 engine and 5-speed automatic, passing isn't a problem. I just put my right foot down, and caravans and all other nuisances disappear behind me. My first three months in Australia learning to drive on the left side of the road were very exciting, both for me and for the other drivers. (Exiting parking lots or "kah pahks" for some reason presented the most difficulty.) So I have a certain amount of patience with other drivers as long as they are at least making an effort to get out of people's way. 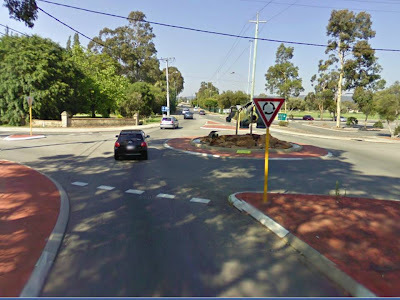 One thing that most Australian drivers understand which leaves American drivers utterly confused is the Roundabout. An alternative to the ridiculous and dangerous 4-way stop intersection, a roundabout is a one-way circle at which you only have to look and yield to one direction while everyone else yields to you. When used properly, no one ever has to stop. If there's a car already in the roundabout and likely to cross in front of you, you just slow down a little so that you swing in right behind that car. But it means you have to pay attention, look ahead, and plan ahead. Admittedly that's asking far too much of some drivers. I've seen a few of these useful innovations appearing in the United States on recent visits home, and they are evidently too much for American drivers to cope with. They approach, stop, look all directions, and then proceed down the wrong way entirely. But in Australia as in other parts of the world that have used roundabouts for decades, they work very well because people grew up knowing how they work. Roundabouts save time, reduce congestion, are safer than intersections, and cost far less to install and maintain than traffic lights. I always drive anywhere I go as though my hair was on fire. This minimizes the amount of time spent on dangerous roads, and is therefore statistically the safest thing to do. While I realize certain members of the geriatric public will find that terrifying and rude, they really have nothing to fear. I am totally focused on the road and on other cars. I don't blabber mindlessly on a cell phone or allow my mind to wander aimlessly while holding peoples' lives in my hand, and I look as far ahead as possible. I get out of people's way promptly and efficiently without causing unnecessary delays, even if that means occasionally going around a corner on two wheels. To my way of thinking, driving unnecessary slow with a tail of cars behind you is the most inconsiderate, rude, and thoughtless thing a person can be guilty of. Why do elderly people drive so slow? It doesn't make any sense, when you think about it. When you don't have that much time left, you shouldn't waste a moment of it! Get where you're going as fast as possible. And if you get a few points on your license, so what? You don't need a drivers' license to get into heaven. St. Peter isn't going to call up your driving record on his computer terminal. Besides, if you make it all the way to retirement and STILL either don't know how to drive, don't own a really fast car, or don't have your own uniformed chauffeur, you just haven't been paying attention. If you believe, as I do, that life on this planet is precious and short, then why not also drive that way: with your fullest attention on what you're doing and your right foot pressed down hard. I only looked up because of the noises caused by this behemoth crashing into things while flying around the Shed. I am TRYING to read, if you don't mind! The noise didn't stop, so with a sigh of exasperation I got up, found a jar, caught the thing, and popped it in the freezer. Then I went back to my book, "The Nutmeg of Consolation." A chapter later, I remembered the bug. Oops. It had a lot more fur than I feel is strictly necessary, a hard shell, and far too many sharp barbs on its legs. It was also about the size of my thumb. The human mind has the ability to magnify things according to how unpleasantly they are behaving. 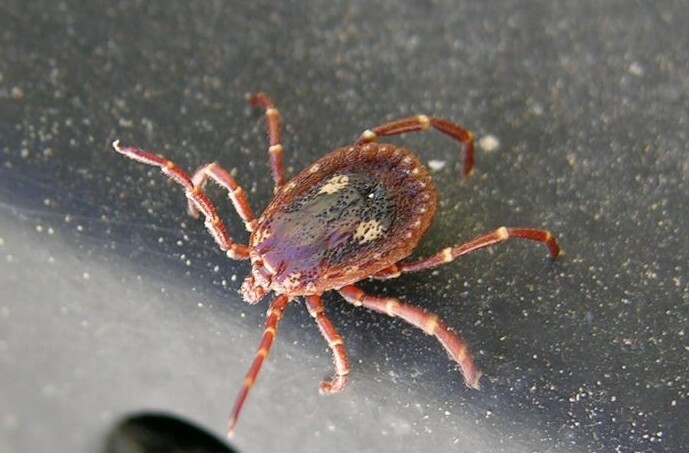 This means that if this bug were buzzing around your living room, it will appear to be the size of a tennis ball. If your wife sees it in the kitchen, she will observe it to be the size of a grapefruit. In the bathroom, it will appear to be about the size of a basketball. Resting on your pillow, it actually dwarfs a Labrador. And is twice as hairy. But in the Shed it's just another Australian bug. Albeit one of the larger ones I have personally been brave enough to touch, even when frozen solid. More Bugs Than You Can Shake a Stick At. And believe you me, you can shake a stick at an impressive number of bugs if you set your mind to it. I had the opportunity once, in the back room of a natural history museum where there was row after row of cabinets full of insect storage trays. There were so many, I was only just able to shake a stick at them all. Thousands upon thousands of separate species of bugs of every kind, each identified, pinned and labeled in a tray with scores of other species all meticulously sorted by genre and family, the culmination of many lifetimes of dedicated work. What a waste! They're only bugs, after all. A couple of cans of Raid could have sorted them out just as well. 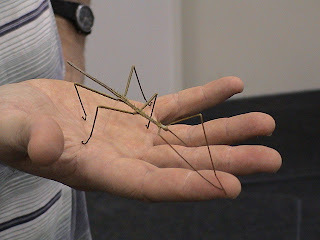 And if you want to see bugs in endless variety, just come out to Australia. The coastal scrubland north of Perth has nothing remarkable about it until you take a closer look. Some 40 million years of geological stability created the right conditions for an explosion of biodiversity, resulting in perhaps millions of species of plants, insects and and spiders, many of which are still unknown to science. That Noah must have had to make thousands of trips down here and back, and he must have been really good at catching spiders. I wonder that Mrs. Noah didn't have something to say about it. But for someone who cares nothing about words like "biodiversity," "genre," and "Linnaeus," they're just curiosities that wander in front of my camera lens from time to time. Sometimes making a detour through my freezer to make them more compliant models. Five minutes usually does it, and as they slowly thaw out and stretch their ridiculously numerous limbs, you can take all the pictures you want from every angle. Longer than that, and they come out dead. Be careful not to forget and leave them in the freezer for weeks, because someone might find your frozen specimens and think you're some kind of a psychopath who is starting out small. Or that you have some very odd dietary habits. Below is a gallery of just a few of the weird creatures I have encountered by doing nothing more than hanging around Western Australia with a camera. Imagine what a really dedicated person could do. Bore us all to tears, most likely. Remember, you can click on the images to see them larger. 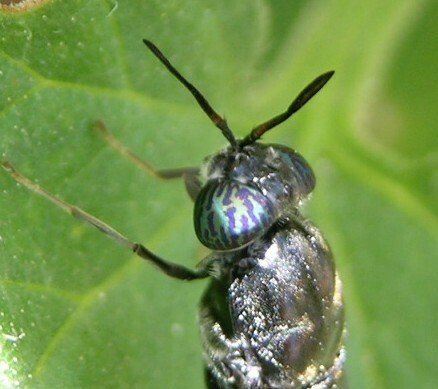 The blue-green eyeballs of this large fly caught my attention. The exquisite detail and subtle coloring made no difference whatsoever when my swatter got involved. I don't know about you, but I've never really looked deeply into a cricket's eyes before. Don't think I'll bother doing it again, though. It's kind of creepy. 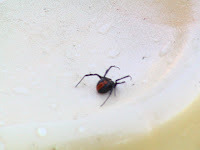 I discovered this large Redback living inside one of my son's outdoor toys when he was about five. Constant vigilance is essential. Panic is optional. Lest we paint all Australian critters with the same malevolent brush, here's a friendly, harmless and cute (in his own way) animal my son kept as a pet for about 6 months. He named it Pickett, The Bush Cricket. He had a soothing melodious song played by sliding his wings together that went something like "zzzzzzzzzzzzzZZZZIP!" OK, it got a little repetitive after about the 400 thousandth time, just like the original Pickett . But he didn't eat much, didn't get hair all over everything, never at any time chewed the cord off my power drill, and never needed to go to the vet. Except maybe once, but by the time we knew anything about it, it was too late. 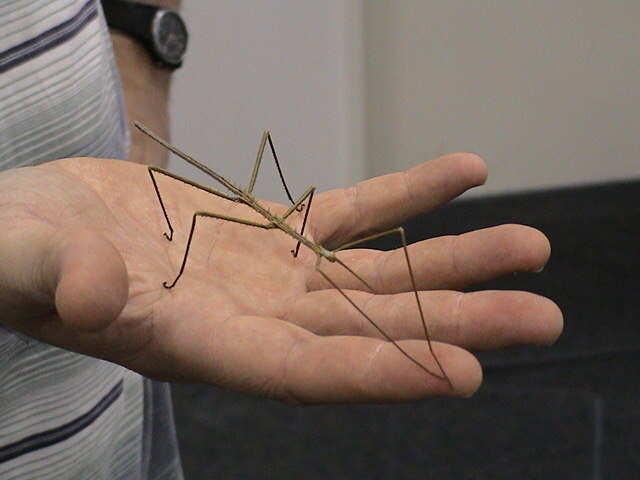 Also friendly and harmless is this Walking Stick I found, seen here posing for the camera. I only wish I could somehow give you a sense of its true size. Harmless weevil, wondering where the heck he is. Another marginally less harmless weevil, this one of the Punk variety. If you were forced to eat one of these, which one would it be? That's right. You must always choose the lesser of two weevils. Weird Bug in the shape of a hairy bowler hat. Scary orange and black wasp, digging a hole. Yes, it shocked me too. No, I can't imagine why, either. But there it was. Digging for all it was worth. Feathery moth caught in the rain. Ghostly grey spider. Never seen anything like it before or since. Nasty, evil Kangaroo Tick. I do not like them, Sam I am. I do not like them on a farm, I do not like them on my arm. I will not have one as an egg, I will not have one in my leg. At first I didn't realize this was a bug at all. Then I saw it move! It is the strangest thing I think I've seen yet. Is it a type of cricket that has been stretched out? What does it imagine in that tiny brain that it is doing in my Shed? See, THIS is what a cricket is supposed to look like. Except perhaps not quite so . . . pink. Fancy Green Moth. I find it easier to name them myself rather than trying to look it up somewhere. It's less work that way. Christmas Spider. Would somebody tell me, please, what the hell kind of place has Christmas Spiders? Halloween Spiders, OK. That would probably work. But spiders just don't go with any Christmas I understand. I suppose they are somewhat festive and decorative in a way. Maybe it's an Australian thing. More on these come December at The Shed. It's not junk food. It's not driving slightly over the posted limit. It's not carrying a few extra pounds around the middle. It's not chlorine or fluorine in the drinking water. It isn't those overhead high-voltage power lines (an awe-inspiring monument to what separates Man from the animals: his ability to make electricity). Neither is it drinking from plastic bottles, cooking salty food in a teflon pan, or licking cholesterol-based pork-flavored frosting directly off of aluminium pots. It's not even duct-taping a dozen active cell phones to your head and calling all of them at once. None of these things can actually kill you. Stress is the real killer. Do something about stress, and these other risk factors take care of themselves. Ignore stress, and you're caught in a non-stop game of whack-a-mole with a never-ending stream of environmental health hazards, many of which you can do nothing about. But what can your average Joe do about stress? Plenty. When men are relaxed, composed, well-rested and get the required amount of sleep, they perform better on the job, have stronger marriages, have better relationships with their kids, fewer car accidents, fewer health problems, more hair, and a longer schwanz. Men, it is virtually YOUR DUTY as a husband or father to go lie in a hammock. RIGHT NOW! Here's how to make hammock-time a safe and enjoyable means to a longer, happier life, rather than the painful, embarrassing Funniest-Home-Videos experience it has the potential to become. 1. Find two stout trees in a quiet location that are 12 feet apart and each at least 8 inches in diameter. I strongly advise against hammocks slung on a metal frame, between posts of a patio, or on hooks screwed to a wall or ceiling. No hook, eye bolt or screw from a hardware store will do the job, and 2x4s or even 4x4s are not suitable. You need trees. If the trees are too close together, your bum will drag on the ground. If they are too far apart, your bum will drag on the ground. Weird, isn't it? It's paradoxes like that which motivated me to study physics and mathematics in the first place. The really important questions in life. 2. Get two pieces of strong rope, half inch diameter give or take, about 5 feet long, but long enough to wrap around your trees three times with a foot or two left over. Tape and melt the ends to prevent fraying (if natural fiber, tape or lash the ends and apply glue). I like to wrap the rope in tape at the cut before I cut it, to forestall any unraveling. 3. One end of the rope attaches to the loop on the end of your Hammock as shown. Pass the end through the loop, behind and around the hammock cord, and then under itself. Do not make a more complicated knot than this, because a) it will not hold any better, b) it will be more stressful on you and on the rope. The secret to hanging in there for the long haul (physically and metaphorically) is to manage stress and keep things simple. Second pass: goes under first pass. 4. The other end of each rope is wrapped around a tree at about head-height like this. The second pass goes under the first, on the side of the tree facing directly away from the other tree. The third pass makes a loop which is put under the second pass as shown. Why a loop? When it starts raining you can pull this end of the rope and have your hammock stowed away in seconds flat. Again, don't try to make the knot more complicated. If done correctly, the rope will break long before this knot ever lets go. The bark of the tree provides friction against the rope, so don't attempt this on metal poles, smooth timber posts, or on anything other than a natural tree, or with anything other than twisted multi-strand rope. Third pass: loop held by second pass. 5. See that the hammock hangs approximately as shown (below). If it hangs too slack, it will be uncomfortable. If it doesn't hang enough, you could break the ropes and end up with a bruise on your backside and your ego. 6. Lie diagonally across the hammock, not lengthwise. Hammocks are more stable this way, and you will not flip over and fall flat on your face to the utter glee and amusement of anyone who happens to be videoing you on their cell phone. An empty hammock forms a geometric shape called a Catenary. It is the solution to an elliptical integral equation which has no simple algebraic form. It is one of Nature's most beautiful shapes, in my opinion. Interestingly (well, to me anyway) it is also the shape assumed by a thin, flexible elastic object, such as the blade of a saw, when the ends are pushed towards one another. When a typical 200 pound man sits in the middle of a hammock, how much tension is on each rope? Would you say one hundred pounds, which would be the total weight shared evenly by the two ropes? No! This is why many hammocks fail. The rope tension is actually much higher than that. If the trees are 12 feet apart and the total hammock length is 15 feet, then the rope tension is 167 pounds. If you shorten the hammock by 1 foot, the tension increases to 194 pounds. Taking another foot off makes it 260 pounds. I'll leave the details of the vector geometry for the reader to do as an exercise. As the hammock is shortened so that it doesn't hang down at all, the force theoretically approaches infinity. But long before that happens, the trees lean inwards to reduce the tension, or the rope stretches slightly, or something breaks. Again, do not use metal hooks, screws, bolts, hangers, eyes, or anything from a hardware store other than good, honest rope and two solid trees in a quiet location. If these steps are followed to the letter, I personally guarantee you total relaxation, longer life, better health and significantly fewer incidents of public humiliation. Or your money back. What Is Secret Men's Business? In an unbelievably harsh landscape such as Australia, in which survival is not at all certain, what is there to aspire to? To posses? Conquer? What is there to attain? There is one thing. And it is the only thing worth having whether you are alone in the middle of a burning red desert or on the throne of an empire surrounded by subjects. There is mastery over your own self. Secret Men's Business is a general category of things that men do only amongst themselves or entirely alone, and includes sacred initiatory rites or rites of passage, rituals of atonement, preparation for battle or marriage (surprisingly similar), grieving, renewal, investiture of authority, and prayer. It is not that women can't do these things, the point is that these things sometimes need to be done separately. Women have their own "secret women's business," events which men are forbidden from witnessing on pain of summary death . Women post their guards with spears and orders to kill on sight any male that approaches, no matter who or why, strangers, husbands, boyfriends or children alike. It is strictly enforced, far more so than secret men's business. "But how is it secret if you're telling us all about it?" Good point, and the answer is that "secret" doesn't refer to the general content, but only to the conditions. Certain things have to be done alone or only in the company of men in specially designated places, even though everyone knows exactly what is being done. And this is for the good of all. One of the results of this arrangement is that spouses do not get the mistaken idea that they own each other like property, and that they get to be involved in every aspect of their partner's life. I know western women who think they are entitled to know every detail of everything their husbands do every minute of every day, and if possible to be directly involved in it if not actually in charge of it. I suppose their greatest fear is infidelity, but ironically they are doing everything necessary to ensure that it happens. Eventually. When men and women openly embrace and respect Secret Men's Business, there is greater trust, respect and understanding in a relationship. If a man is faithful to his wife, it's because he chooses to be, and that should mean far more to a woman than enforced fidelity. He is to be far more respected than if he never had the opportunity to stray. But this goes far beyond western society's mad, blind obsession with fidelity in the midst of almost universal infidelity. As essential as it is for a happy life, it's only the warm-up lap of the Indianapolis 500. The main event to which so many people never gravitate is the growth and development individuals experience as a result of their circumstances, and in particular, as a result of their relationship with a spouse or partner. As the Aboriginals discovered over countless generations, a man's development into an Elder, a wise, trusted, powerful and benevolent leader upon which the survival of his family depends, is a spiritual quest undertaken on two parallel tracks. First, it is done quietly, privately, in secret and under the guidance of experienced and accomplished men of immense spiritual stature. Second, a man must be married, live in the world and have sons to finally understand. Is this for everyone? No. Some men will choose not to become an Elder and go a different way. When families, clans, businesses, churches or nations fail to develop their boys into men of leadership quality, they eventually cease to be. But when we say to our sons and to our men, as in this initiation rite recorded in ancient Bedouin scripture, "arise from the dust, my sons, and be men, and be determined in one mind and in one heart," then almost anything is possible. Boys will not be swept up in gangs, drugs, and violence, but instead will prepare for their future with a will. Men will not be defeated and ruined by depression, addiction and suicide. Instead, men's lives will be meaningful, purposeful and fulfilling. Communities and families will be strong in the face of the unfathomable challenges to come. Men, be "united in all things, that ye may not come down into captivity. Awake, my sons; put on your armor. Shake off the chains with which ye are bound, arise from the dust and come forth out of obscurity." Guys, do you have a place you can go to do your Secret Men's Business? Here is one place, for a start. A church or temple is also an excellent place for men, and you don't have to be a Ned Flanders, a God-Botherer, or some kind of religious zealot, either. Although I'm not Catholic, I've had many great experiences at the Benedictine monastery at New Norcia in Western Australia. Taking an evening meal in the male-only Rectory in the Benedictine way of total silence is a wonderful experience. It is the most dignified, respectful, self-respecting, calming, meaningful and affirming way to eat that I have ever experienced. Up until that point in my life, mealtimes were demeaning, accusatory, belittling, and inflammatory exercises in male denigration. Had I not usually been responsible for cooking the meal, I might have declined any invitations entirely. In our society, fathers have lost their authority and the respect of children and spouses alike, and this much to the detriment of everyone. It is not necessary to equate patriarchal authority with subjugation or abuse, nor is it useful to uproot all tradition just for the sake of a few occasions when it didn't suit. We teach those around us exactly how we are willing to be treated. Men who live a life of respect for themselves and reverence for their Secret Men's Business, whatever it may be, will be treated with respect, and will be revered when they are old. Those doing the respecting of their husbands and fathers will experience the benefits of more security, stability, protection, and comfort in a very uncertain world. Taking Down an Impossible Tree. With Science. A large eucalypt tree in the general category referred to as a "White Gum," but probably a kind of Wandoo was overhanging the Shed and dropping its leaves onto the roof, contaminating the rainwater that I depend on. It can be seen in this picture, in the upper right-hand corner. Because the tree was overhanging the shed and threatening to smash it when cut down, Geoff offered to help out with his truck and a rope to pull on it. But when he came to inspect the tree more closely, he turned right around and said, "Can't do it. Leaning too far over. It'll drag my truck right along the ground and smash your shed anyway." So I had to figure out another way. Did I mention the tree was over 60 feet tall? "If only I had a 1-inch steel cable, roughly 200 feet long," I said to no one in particular. "Like the kind that mores ships to a dock. If I had something like that I reckon I could sort this tree with no trouble at all." A few weeks later I was down at the back of the block fossicking around in the junk that the previous owner had left. Isn't fossicking a great word? It's Australian for "rummaging." I was out fossicking around, and you'll never credit what I came up with. A 1-inch steel cable roughly 200 feet long. Coiled up inside an old oil drum. To quote the immortal Dave Barry , I am NOT making this up! I dragged it out and made a loop in one end. I tied a light line to a heavy stick and managed to throw it over a large branch of the tree. The line was used it to hoist over a stout rope. I used the rope to carry up the very heavy steel cable and slip-knotted it around the tree. The other end of the cable was anchored to the base of another large tree some 100 feet away in the direction away from the Shed, and away from the lean of the tree. One problem: a large branch of another tree was in the way of the cable, so it had to come off. If Funniest Home Videos teaches us nothing else, it is that guys on ladders with chainsaws will always come to grief. That, and no one has ever approached a trampoline without injuring themselves and then being sniffed by a dog. Also, piñatas are to be avoided AT ALL COSTS, unless you are wearing a cup. The reason a guy will always fall off the ladder when he cuts a large branch off a tree is simple physics. What's holding up the branch? The tree, of course. How is it doing it? By applying stress through the trunk of the tree. What happens when that stress is suddenly removed? Lots happens! Later I acquired a second-hand 3-ton chain hoist (ex-rental) and used it to take the slack out of the cable. Then after taking one last look around, I was satisfied that I had taken every precaution. The tree, according to my calculations, would fall on a line perpendicular to the cable and about 30 degrees away from the Shed, missing it with all of its branches. Every angle was correct. My position would also be perfectly safe. I fired up the chain saw. The cable slip-knotted over a fork in the tree that was originally 30 feet off the ground. The rope used to hoist up the cable is still attached. After cutting about two thirds through the trunk, I heard a loud pop. The taut cable dropped about 6 inches and the entire tree gave a slight shiver. A shudder. I set down the chain saw and ran to where the cable was anchored. I hauled on the chain hoist and tensioned the cable up again, but the tree held fast. After waiting to see if anything would happen, I cautiously resumed chain-sawing through the trunk in a cut that was considerably more open than before. All was going to plan. After chewing through a bit more of the 14 inch diameter trunk, the tree popped again, gave a shiver, and seemed to go slack. It came over all lazy and swayed there as though it were about to faint. That distinctly lower-frequency motion indicated to the vibrational engineer in me that the tree had almost no stiff support any longer, and was simply balancing in space. I dropped the chain saw once more and ran back to the hoist. I didn't have to haul on it very much before the tree began a long, slow-motion tilt, picking up speed, and rushing faster and faster towards the ground. It made an almighty CRUNCH!, broke into several large pieces, and then lay still. Exactly in the spot I had planned for it to be. Nothing damaged, no injuries, no errors. With a bit of engineering and physics, the impossible becomes a simple one-man job.